In 2006 the American Civil Liberties Union exposed the expansion of border control activities to within 100 miles of any point on the U.S. border. ACLU labeled this area the Constitution Free Zone . Search and seizure options at border checkpoints are not constrained by the Fourth Amendment to the U.S Constitution, which protects against unreasonable search and seizure. Now, thanks to the Department of Homeland Security (DHS), just because they’re within 100 miles of the nearest border nearly 200 million citizens are subject to searching and procedures that previously were used exclusively at border checkpoints. What do they have in store for citizens on the northern border? Some highlights of the program include: Checkpoints far from the border (but within the 100-mile limit); increased patrol activity, remote video surveillance systems, upgraded surveillance and telecommunications systems, high-powered X-ray machines of various kinds and fencing or vehicle barriers at selected points along the border. The new and improved “High-Energy X-Ray Imaging Scanners” ( Northern Border, p. 2-12 ) expand national security radiation exposure from airline passengers to the much broader audience of drivers and their families, for example, who choose to visit and return from Canada, as well as those who choose to visit the United States from Canada and anyone unlucky enough to drive into a checkpoint in the Constitution Free Zone. Buried within the report was this finding: DHS asserts that even though “exposure to high levels of radiation would increase a person’s probability of developing cancer and hereditary genetic damage,” Northern Border, 8-13-10, p. 201 ), the impacts of this program will be “negligible.” One wonders if their analysis has considered the kids sitting in the back seat of the car, protected by nothing more than that back seat and their clothing while a CBP agent X-rays the car’s trunk with a mobile device. It’s hard to feel warm and fuzzy about impacts being “negligible” when you can’t see any analysis to support that assertion. An enhanced security zone along the longest peaceful border in the world should raise suspicion. As Paul Craig Roberts has pointed out, there have been no successful terrorist attacks on the United States since 9/11, at least none conducted by foreign governments. (Arguably, the response to Hurricane Katrina can be seen as a de facto terror attack on the people of New Orleans). There were two cross-border threats intercepted in December, 1999 through the efforts of Customs and Border Protection agents and others at the Canadian border in Vermont and Washington state . But that was with the systems and technologies of that time. 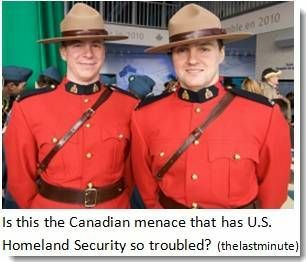 Has Canada suddenly become a hotbed of virulent anti-American activity? Are the Mounties and other law enforcement agencies in Canada turning a blind eye to known threats? Are we expected to believe that the nation that turned down a featured role in the coalition of the willing has suddenly become lax on enforcing international law? Is there another motive behind the seeming militarization of the Canadian border? My choice for primary motive is enhanced revenue opportunities for the defense and national security industries. The U.S.-Canada border is over 4,000 miles long. The opportunities of a 100-mile ribbon along that border are expanded by all those people living there — approximately 50 million. This could be a huge payday. After all, Iraq and Afghanistan must end at some point. What better project to take up the slack for defense industry taxpayer subsidies than a massive border build-up in areas that provide safe working conditions? Look how quickly the government deployed full body scanners in airports across the country after the underpants bomber affair. Even though highly reliable witnesses saw that bomber bypass a security check at his point of departure, Amsterdam, the administration and security experts acted like a scanner would have somehow prevented events that had nothing to do with any type of security check. The absurdity of government policies on war, defense spending and the economy, and the elimination of more and more constitutional and other protections opens the door for more sinister interpretations. There will be speculation that just maybe the financial elite who run things see a total collapse of the economy. They should know — they created it. Or maybe they see a total loss of rights and an end to the pretense of freedom. Instead of letting all those consumers (aka citizens) cross the border in search of a reasonable life, they may just want to keep us around for the next big holiday shopping spree. The border security program as prison bars for citizens is far-fetched but, arguably, it is no more far-fetched than a plan to beef up the border with a friendly, cooperative neighbor. We live in a time of great decline. The cause of that decline is the ownership of virtually all of the tools of political control by those whose sole motive is to make more money than the huge sums they’ve already accumulated. For positive change to become an alternative, those who have failed so miserably need to be sent packing, replaced by true servants of the people. Special thanks to the anonymous source who explained the significance of the report and to Cryptome , which listed the report summary and links on the date of publication. You may submit comments via Internet at http://www.northernborderpeis.com/get-involved.html , via telephone at 1-(866) 760-1421, or via mail by posting written comments to: CBP Northern Border PEIS P.O. Box 3625 McLean, Virginia, 22102. Comments must be received by October 31, 2011.